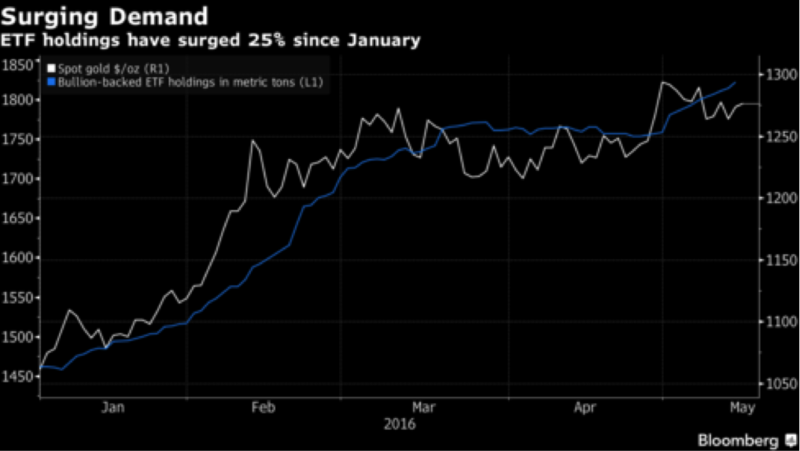 The great gold rush of 2016 is gathering pace. Holdings in exchange-traded funds have now surged by a quarter, with investors taking advantage of lower prices over the past two weeks to enlarge stakes on rising concern about central bank policy making worldwide. The holdings have increased to 1,822.3 metric tons, the most since December 2013, according to data compiled by Bloomberg, after bottoming at a seven-year low in January. In the past two weeks, as prices lost 1.6 percent, ETFs swelled 63.2 tons, rising every day. Gold is the best-performing major metal this year after silver amid rising concern over negative rates in Europe and Japan and whether the Federal Reserve will be able to tighten further. 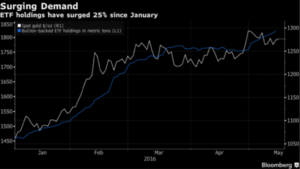 Demand jumped to the second-highest level ever in the first quarter, according to the World Gold Council, and billionaire hedge fund manager Paul Singer has said gold’s rally may just be beginning. Investors are being driven to gold on a structural shift in investment demand, according to Bernard Aw, a strategist at IG Asia Pte. After the Fed raised rates in December, investors have been scaling back expectations of further increases amid concern about the strength of the global recovery. The chances of a hike at next month’s policy meet are just 4 percent, down from 75 percent at the start of the year, according to Bloomberg data. Higher U.S. borrowing costs typically hurt gold prices while boosting the dollar. Bullion for immediate delivery has rallied 21 percent this year, gaining to $1,303.82 an ounce on May 2, the highest price since January 2015. The metal traded 0.7 percent higher at $1,282.40 an ounce at 4:30 p.m. in Singapore, according to Bloomberg generic pricing. Singer — whose firm Elliott Management Corp. oversees about about $28 billion — told clients last month that if investors’ confidence in central bankers’ “judgment continues to weaken, the effect on gold could be very powerful.” Stan Druckenmiller, the billionaire investor, said this month while the bull market in stocks is exhausted, gold is his largest currency allocation. While central bank policies may have contributed to gold’s gains this year, some countries’ banks — notably in China, Russia and Kazakhstan — have also been substantial and consistent buyers. The World Gold Council estimates that nations are expected to buy 400 to 600 tons this year, compared with 566.3 tons in 2015, according to Alistair Hewitt, head of market intelligence. Even some the of leading bullion bears have had to backpedal this year as prices advanced and expectations for U.S. rates shifted. Goldman Sachs Group Inc. and Singapore-based Oversea-Chinese Banking Corp. beefed up their price forecasts last week, though both said they maintained their bearish views. UBS Group AG, which expects gold to drop over 12 months, has increased its short-term forecast, citing uncertainty surrounding the pace of Fed increases as well as next month’s U.K. referendum on its membership in the European Union. The upper end of its range was increased to $1,350 from $1,310, analysts at the wealth-management unit including Wayne Gordon wrote in a report dated May 14.